The transactions you enter in the Quicken 2015 transaction-list window or a transaction form and the checks you enter in the Write Checks window determine the information in a report. To print a report, just choose the Reports menu and tell Quicken which report you want to print. 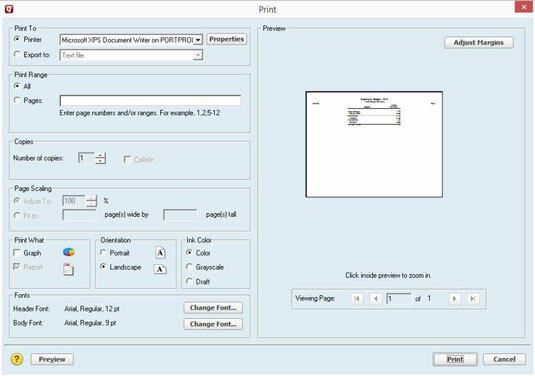 Quicken displays the Print dialog box. To accept the given specifications — which are almost always fine — just click Print. You’ll never guess what happens next: Quicken prints the report! Print To: The Print To option buttons let you tell Quicken where it should send the report it produces: to the printer or to a disk file. If you choose to print it to a file, Quicken displays another dialog box, which you use to specify where the print file should be located and what the print file should be named. Print Range: Printing a long report? Consider using the Print Range option buttons and text box to specify that you want to print only a specified range of pages. As you might guess (if you’re a clever person), select the Pages option button and then specify the individual pages (separating pages with commas) or the range of pages (separating the start and end page range with a hyphen). Copies: As you’ve probably guessed, use the Number of Copies text box to tell Quicken to print multiple copies of a report. Page Scaling: For some reports — although not all — you can use the Page Scaling option buttons and text boxes to tell Quicken that it should try to squish the report onto a smaller number of pages. Ever the thoughtful software program, Quicken provides two squishing methods. You can select the Page Scaling Adjust To option button and then enter a squishing percentage. Or you can select the Page Scaling Fit To option button and then specify the report size as a certain number of pages wide by a certain number of pages tall. Print What: The Print What check boxes let you flip-flop between printing a graph and printing a report of the Quicken data you’ve said you want to see a report on. The easiest way to see what this report option does is to select and deselect. Orientation: The Orientation option buttons allow you to specify how Quicken prints a report on pages: vertically (Portrait) or horizontally (Landscape). Again, if you’re confused about this option, experiment by selecting the different buttons. When you click a Print dialog box button or enter some value in a Print dialog box field, Quicken redraws the Preview window (on the right) to show you what the report looks like with your new specification. Ink Color: If you use a color printer, Quicken provides Ink Color option buttons, which let you choose whether you want to print the report in expensive colored ink, in cheap black ink, or in grayscale so that you can go all film noir about your finances. Fonts: The two Change Font buttons let you customize the look of your report by changing the font settings (point size, font, style, and so on) of the text used for your report’s header text and body text. The way to most easily figure out what these options do is simply to experiment. You can’t foul up or corrupt your Quicken data by fiddle-faddling with the Print dialog box settings. And this is true even if you do something truly visually outrageous. Adjust Margins: Click the Adjust Margins button (upper right) to add margin-setting boxes to the Preview area in the Print dialog box. After Quicken adds these margin-setting boxes, you can change the printed report’s margins by changing the margin settings.